The Stockman Eight Teat Compartment Feeder is a sturdy and durable feeder that can feed up to eight calves at once. The feeder is divided into compartments to ensure that the milk is being evenly distributed among the calves being fed. All Stockman calf feeders come fitted with peach teats but the 22mm hole allows for a wide range of teats to be fitted. 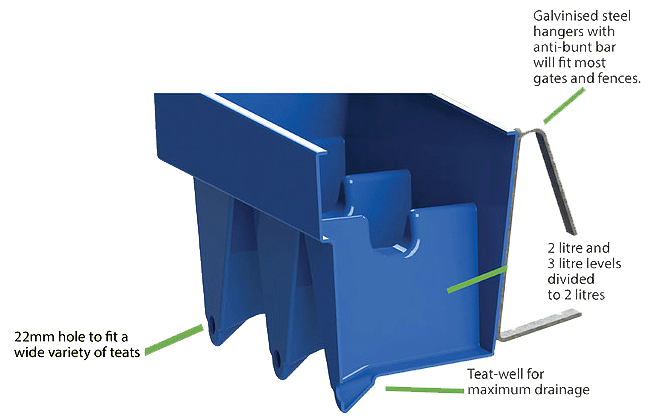 The Stockman Eight Teat Compartment Feeder has a maximum capacity of 56 litres. Design: All Stockman Compartment Feeders have been designed with ease of use in mind. The teat well at the bottom of the feeder is angled for perfectly maximum drainage. The teats are spaced at optimal distance to allow calves to feed comfortably. The dividers between the compartments are specially designed to allow 2 litres or 3 litres of milk per compartment. Included extras: All Stockman Compartment Feeders come fitted with peach teats as a standard, but the 22mm hole allows other teats to be fitted if desired. The feeders also come fitted with galvanised steel hangers which are strong and durable and have two different hanging positions. These hangers will fit almost all gates and fences.